Transitional style combines classic and contemporary designs. This transitional mirror features a large rectangular frame with a lovely window pane design right over the glass of the mirror. It is finished in an aged bronze and is accented with black highlights. 21" wide x 53" high x 1" deep. Hang weight is 27 lbs. Glass only section is 16" wide x 48" high. Surrounding frame is 2 1/2" wide. Aged bronze finish with brushed black highlights. Resin frame construction. Beveled glass. Can this be hung in either direction? 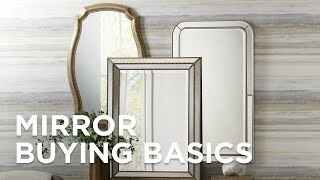 BEST ANSWER: Yes, this mirror can be hung both horizontally and vertically. This wonderful wood wall mirror features a distressed gray finish and a window design that creates visual interest in any room. Easy to installthe Abbey rectangular wall mirror is a practical choice. Howard Elliott Parker Creamy White 28" x 34"
With beveled glass and a creamy white finishthis rectangular wall mirror completes a room in classic style.